Dr. Lowery Stokes Sims, Director 2000–05 and President 2006–07, generously agreed to be interviewed and to share her personal perspectives and stories about her time at the helm of the Museum. Her comments are edited and condensed here. What were you doing before you came to the Studio Museum? I had been at the Metropolitan Museum for twenty-seven years. I joined the Met in 1972 and worked for about three years in what they called “community programs.” That was an interesting place to be, because the department had been started in response to community dissatisfaction with the Met, particularly the Harlem community, over the 1969/70 Harlem on My Mind exhibition. This was a sort of first wave of a diversification and outreach in museums. We did a lot of outreach through exhibitions and workshops. In retrospect, it was a very important phase of my career because I started making contacts with my peers and colleagues in different institutions, and meeting artists, which really served me when I became a curator in 1975. 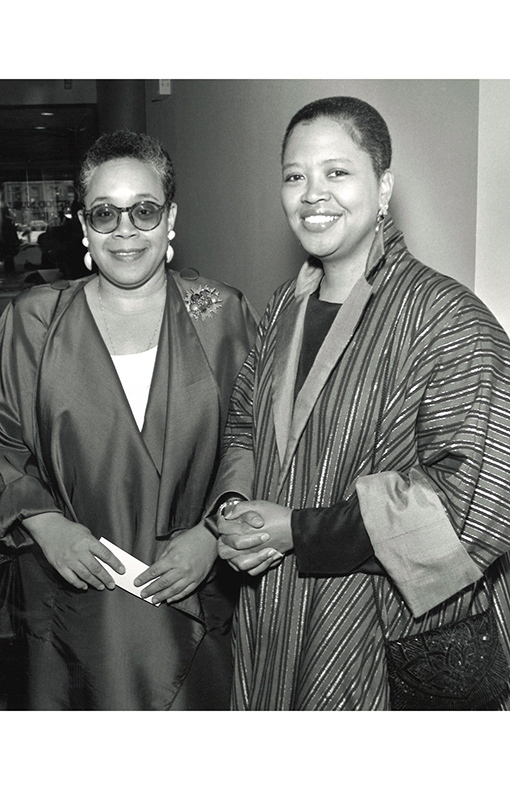 I had been aware of The Studio Museum in Harlem almost from the beginning of my career. When I got to New York, I became close friends with Courtney Callender, who was the Director of the Museum at the time. Courtney was not your typical director—he was kind of like, one of the gang. He was the blithe spirit who led things on. And he had lots of connections with the city. He was an agent for change, for support of artists. He really got the Museum from its beginnings to the next phase, which started with Mary Schmidt Campbell. The Studio Museum was an important second home for me because it was a place I knew I could come and meet my African-American peers. I did several projects with the Museum over the years, including a wacky exhibition in 1977 called Living Space, which was about public housing. I served on panels, and worked on an outline for a Norman Lewis show. So I always had an active relationship with the Studio Museum. How did you see the Museum take shape over the years? I think that the Studio Museum, el Museo del Barrio, the Bronx Museum, and the Queens Museum were institutions that I had a lot of contact with when I was in community programs. It was fascinating to see each one of them change over the years. Each one of them, in turn, found buildings that announced that they were more permanent than even their founders probably thought they would be. For the Studio Museum, moving into the building at 144 West 125th Street was big deal. The space declared that we were important! I have distinct memories of a group of us, it was Howardena Pindell, myself, my friend Raenelle Garris, and two other women primping to go to the opening of the new building. Back in those days, going to Harlem was a big adventure—and getting cabs to take you was a big adventure. But we were all so excited to walk in and see what Max Bond had done. And then watching the Museum over the years—it was such an important place. When Thelma and I came in 2000, it was a moment when a lot of those organizations were approaching thirty, thirty-five years. The art world had kind of caught up with them in terms of diversity, so people were asking us, “Do you still need a Studio Museum?” And we said, “Yes.” We needed an institution that was looking after our community twenty-four-seven, instead of just in February when you have Black History Month. We needed an institution that was looking after our community twenty-four-seven, instead of just in February when you have Black History Month. It was a key moment. Thelma had been cultivating a generation of artists who were reaching maturity. Harlem was changing—coincidental with our coming, Bill Clinton had opened his office up here. It was a key moment in Harlem and for black artists domestically and globally. We basically ran with it, and started a lot of programs that people really pay attention to now, like Expanding the Walls. The way that Sandra Jackson-Dumont and her staff conceived of that program brought together in the Museum a number of components that before would not have been together. First of all, it focused us on the Museum’s collection of James VanDerZee. Second, it was a program for youth at a time when everybody was very concerned about K–12 education. And it was conceived as being intergenerational, which was really important. So the fact that these students could come for a year and dialogue with artists, talk about images, and create art that reflected VanDerZee was a very important vehicle to connect the Museum to the community. If the students were going to make photographs that reflected VanDerZee, they’d have to go out into their community, because VanDerZee photographed his community. We also happened to do a lot of work with making the community aware that we were here. I remember one cab driver who picked me up from a meeting at the Dance Theatre of Harlem. I said, “We’re going to the Studio Museum.” And he said, “What’s that?” He had been driving a cab in Harlem for twenty-five years and didn’t know the Museum was there. Ironically, it had a much more global identity. I remember, I had an intern at the Met who was from some small Russian town in the Arctic Circle and she knew about the Studio Museum. So it was really kind of putting that whole package together. And now, with the new building, it’s really going into its next exciting phase. What was the Museum’s relationship to Harlem? As I said, on one hand, there were a lot of people who didn’t know we were here. And on the other hand, there were people who felt that it should exclusively be about Harlem. I would have to gently remind them that this was The Studio Museum in Harlem, not The Studio Museum of Harlem. That was the way the Museum had been incorporated. I think back to talking to young staff members, like Rashida Bumbray, about Harlem as a kind of psychological space that was very important to them as African Americans. I was always struck by that because I thought it was a generational thing. I was very surprised that in the 2000s, there would be a generation of people who would have that kind of romance about Harlem. I think that the more that we reached out to Harlem, the more we became welcoming place. There were a lot of logistical things we had to do, like reorienting the security staff away from a defensive mechanism, which spoke to old ideas of what Harlem was. The renovation of the facade, which Kinshasha had gotten through the city, was very important. Before, you had this little skinny door and you could see elements of the Museum from the window, but you didn’t know how you could get in. So having the facade let people see what was going on really did open it up. And that was really important for having them feel welcome, and that they could have access to the space.